A new book makes the visual case for why sharks fascinate and frighten us, and for why we should save them. Edmund Burke, Immanuel Kant, and other authors of the Romantic era saw a special emotion in our recognition of nature's terrifying side, the paradoxical pull of the imagery of pain and danger they called the sublime. And no creature evokes this sense more vividly than the shark. 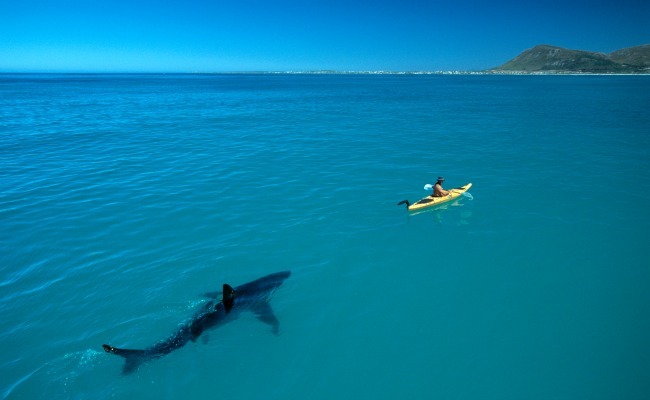 Despite our fears, sharks are among the most negligible threats to human life. 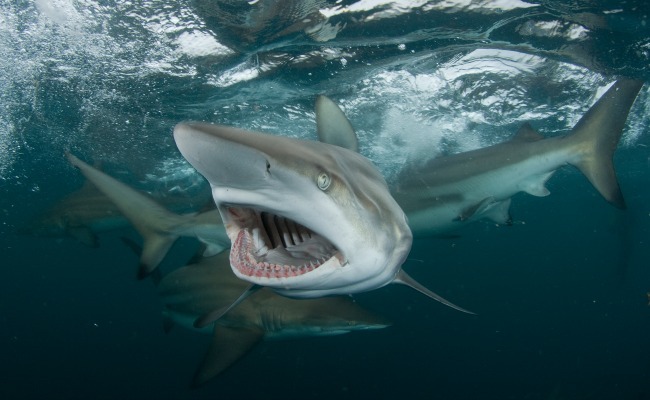 As the dust jacket of the award-winning National Geographic contributing photographer Thomas P. Peschak's new book, Sharks & People: Exploring Our Relationship With the Most Feared Fish in the Sea, points out, fewer than a half dozen humans are killed each year by sharks, while we have been slaughtering 38 million of them annually. 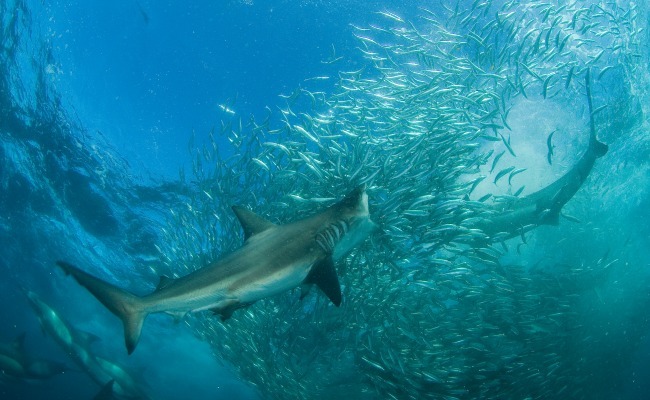 But sharks are radically different from the other animals that occasionally prey on us. In the fiercest lions, tigers, and leopards we can recognize the kin of beloved house cats, in wolf packs the wild ancestors of dogs. (The Orthodox Christian monks of New Skete have even developed a controversial dog training technique, the alpha roll, based on supposed wolf pack leader dominance tactics.) Grizzly bears can sometimes seem deceptively human until it's too late, as the filmmaker Werner Herzog documented in Grizzly Man. And the young of all these mammalian species can be playful companions to humans until the animals reach adolescence. 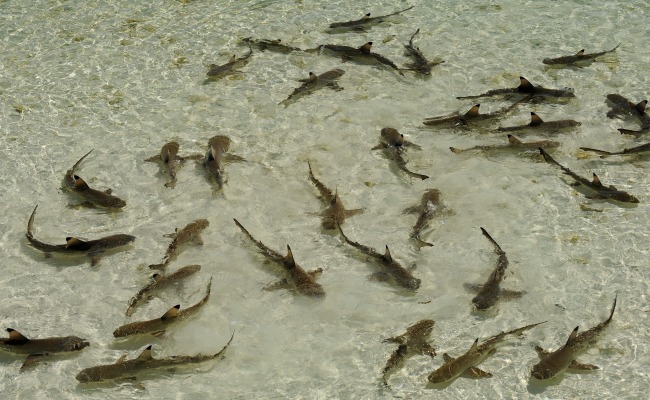 In contrast, baby sharks might be called pups, but they don't act cute. Some of them even start cannibalizing each other as embryos. A set of shark teeth are among the most fearsome objects in nature, and also among the finest of biological designs; Native Americans were trading tiger and bull shark teeth as tools two millennia ago. While it is hard to feel empathy with such a mighty organism, it's impossible to avoid awe—and respect for its athleticism, its superb senses, and its ability to survive centuries of commercial human predation. 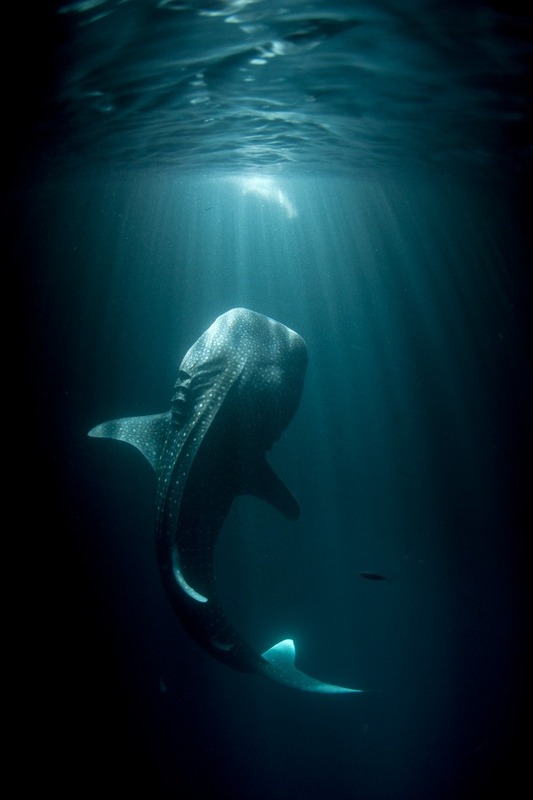 Thomas Peschak makes an eloquent visual case for the sublimity of sharks—and also for their conservation. 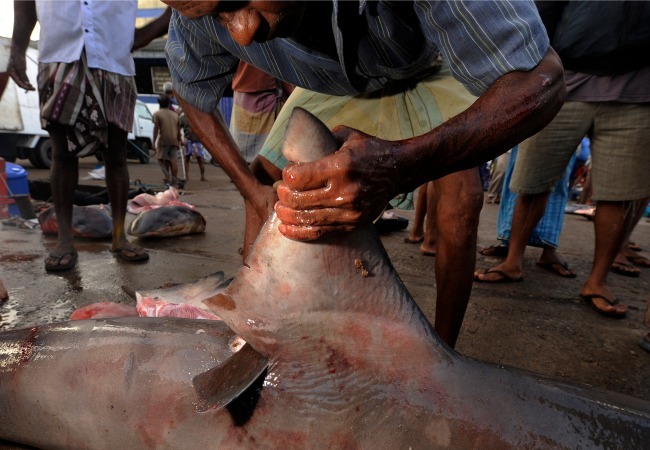 He notes that the media still devotes far more attention to rare shark attacks than to the urgent need to protect them from human depredation, especially the shark fin trade. He might have noted that Peter Benchley, who became wealthy through the 1970s novel and film Jaws, regretted the fear he had sown and became a shark advocate. 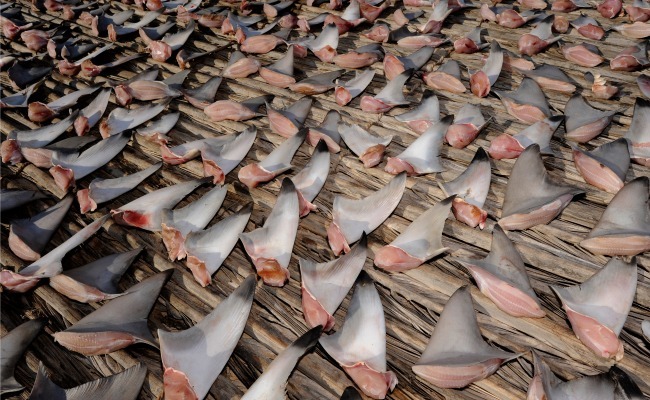 In the long run, though, China's removal of Mao Tse-Tung's ban on shark fin soup as bourgeois decadence in 1987 may have resulted in more shark slaughter than all the horror books, films, and news items together. Great conservation photography like Peschak's, one must hope, will have the power to change attitudes globally. 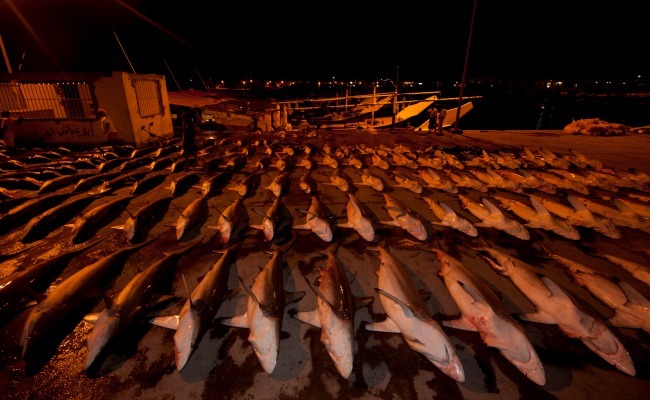 Protecting sharks, it should be added, is in our own self-interest. Like other apex predators, they keep in check the intermediate predators, like cownosed rays, that endanger our fisheries. And the Nobel Laureate psychologist Daniel Kahneman has observed that even in attacking people, sharks paradoxically have saved human lives. For every swimmer killed by a shark off San Diego, 10 other lives were saved by fear of going in the water, until the scare was over. We might never love sharks, we may fear them rationally, but above all we must respect them. They are sublime.